Looking out over the famous fairways of the world’s oldest golf course, the Old Course Hotel is the ultimate place to stay for golfers visiting St Andrews’ legendary links. The Old Course itself needs little introduction, being arguably the most famous layout in the world, however, guests will also get the chance to tackle The Duke's, the Old Course Hotel's very own championship golf course. Voted Scotland's Leading Golf Resort in 2010 and Luxury Resort Hotel of the Year in 2011, The Old Course Hotel is a top-class facility, worthy of its glorious position adjoining the world's most famous golf course. Guests will enjoy one of the country's finest spa facilities, fine dining and the marvellous Jigger Inn pub, a true example of 5-star luxury from start to finish. Many rooms offer fantastic views across the links, towards the town and the golden West Sands. Guests here will enjoy the most luxurious furnishings, and relax in one of Scotland's premier spas. All the delights of charming St Andrews, including the shops and bars, are a short stroll away. The hotel offers both formal dining and outstanding bistro food, while the bar boasts single malts from 119 different distilleries. The management of the hotel constantly strives to provide the best in service and quality, and for this reason the Old Course Hotel is the only choice for celebrities and golf's top professionals. At Kohler Waters Spa, guests can experience one of Europe's most advanced concepts in total well-being. Relax and restore your body as you enjoy the therapeutic benefits of water. Enjoy after dinner cigars, malts or cocktails on the new rooftop deck which provides stunning views of the St Andrews links courses and coast. 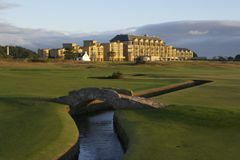 The Old Course Hotel is fantastic and there is no where better to stay whilst in St Andrews. It boasts fantastic views over the 17th and It’s only a five minute walk to the town. Literally golfing paradise! I would rate the Old Course hotel as 5 star. The facilities and service are both first class and we also felt the trip was excellent value for money.